Como – The Pearl of Northern Italy. Northern Italy never seizes to fascinate me. I did write a recent post about the beautiful town of Stresa which is located by the side of Lago Maggiore in the Piemonte district. Moving a bit more to the east and by the side of another lake, Lake Como, is the beautiful and charming town of Como. On reaching the Como Railway station, which is on the Milan to Switzerland train line, one is welcomed by the rather confusing monument by the name of Monumento ai caduti per servizio, the significance of which I rather failed to comprehend. But there is nothing confusing about the town of Como! Lake Como is shaped like an inverted Y giving it a long perimeter. The lake is surrounded by mountains and hills and dotted with beautiful villas and resort villages. I am glad that I visited this city because it also offers some of the most fascinating views in Europe. It did make sense that this city is the adopted home of many celebrities including the likes of George Clooney! One thing which the town of Como has in plenty is class, one would assume this is because of the predominantly rich tourists who frequent this place, but however this is not the reason. The reason why Como is classy is because there are numerous unspoiled villages that surround this town, there are pretty villas with lush gardens and to make everything even better amazing views of the mountains which are snow-capped during winter. There is a 60 minute hop on hop off boat trip which covers Lake Como and this was on the top of my list. The boats and aliscafi of Navigazione Lago di Como connect the town with most of the villages sitting on the shores of the lake. There are not many tours in the world when the guide tells you that “On the left we have the villa belonging to George Clooney”. Apparently he brought the house after falling in love with Como while filming Ocean’s Twelve in 2004. Walking around the town of Como is also a wonderful experience, one finds that Como has numerous works of art, churches, museums and parks. There is the Duomo( which is the seat of Diocese of Como), the Basilica of Sant’Abbondio, the Villa Olmo and the public gardens with the Tempio Voltiano. Apparently this town was also the birthplace of Pliny the Elder, Pope Innocent XI and Alessandro Volta. A beautiful town, perhaps there is ample reason why this town and its surrounding regions have been widely acknowledged as the most beautiful part of Italy! 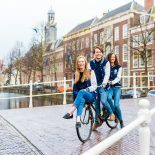 This entry was posted on July 31, 2014 by admin@theleidener in Deepu, Leisure, Travel.